The Vatican fears the Balkanization of the Mideast and works to avoid it, as Putin does for different reasons. The odd Francis-Putin alliance mirrors the contradictions, divisions and lack of strategic vision of the West. The shift towards Putin doesn’t mean the Holy See chooses Russia over the U.S. It’s just a rebalancing. In the absence of an alternative, Assad still appears a sort of lesser evil compared to Islamic radicals. The Vatican has no troops. This explains why in truly troubled times, the Pope badly needs a world power that can be a defender of Christians. Russia, for its part, is active in the Middle East and has influence and hard power, while the West is not really there anymore – at least, not anywhere near as much as in the past. Putin, never a man to miss a ready opportunity for a power play, decided to protect not just Orthodox Christians, but also Catholics in the Arab world. The Vatican also knows that many priests and patriarchs in Syria are pro-Assad, because they fear the rise of Islamic fundamentalism. For different reasons, the Vatican and Moscow also both consider the Balkanization of this strategic region as a negative development – and hope to avoid it. The letter sent by Francis to Putin in September 2013, on the eve of the G20 summit in St. Petersburg, was a recognition of Russia as a key player in the Middle East. The Holy See fears the fragmentation of the present states in the Middle East – and considers the creation of one-party, one-religion nations as a potential risk of war. Furthermore, current developments foreshadow an end of the role of Middle Eastern Christianity as a historical bridge between different faith and cultures. But even without that happening, religious tensions have risen significantly. Putin, for his part, is worried by the prospect of a clash between different ethnic and religious groups. That might encourage Islamic terrorism near the southern borders of Russia and in Central Asian republics at east. The Holy See and Russia share a negative view of the way the West has confronted Assad so far. In particular, they have little regard for the United States’ support to the Syrian rebels. At this point, their common assessment is that the rebels have been infiltrated by radical Muslims and even by groups close to the Al Qaeda terrorist network. That does not mean that the Vatican and Russia see Assad as their champion. Like Washington, Moscow and Papal Rome know Assad is a cruel dictator and want him out. However, in the absence of an alternative, Assad still appears a sort of lesser evil compared to Islamic radicals. What happened in Maghreb and Egypt after the Arab Springs is a terrible reminder of the dangers ahead, particularly for minority Christians. The only clear reality is that a balance of power in the region is over – and that a brand new one is going to be created. The odd Francis-Putin alliance is a signal not of the success of Russia or of a papal desire to distance the Church from western values. It mostly mirrors the contradictions, divisions and lack of strategic vision of the West (whether in the EU or the United States). 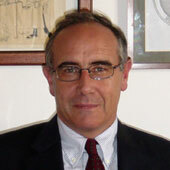 It also underscores a more pragmatic approach of the Holy See when it comes to international relations. 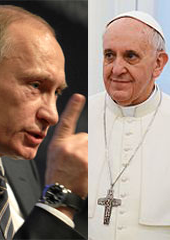 The shift towards Putin doesn’t mean that the Holy See chooses Russia over the United States. It’s just a rebalancing of its position between the two past giants of the Cold War. And it underscores the Vatican’s desire to draw out new lines of dialogue and diplomacy. Moreover, it is a tactical choice, likely to be challenged now by crisis in Ukraine. There Catholics are siding mostly with the anti-Russian protests and new government. Putin is becoming the most vocal attacker of European secularization. He has also emerged as a defender of religious “normal” family values. But the very harsh way in which he pursues the agenda, via widely condemned laws, has created a bit of embarrassment in Vatican circles, even though many of Putin’s conservative views are generally shared in papal Rome. For Putin, all of this is a domestic policy tool. He isn’t concerned about the Vatican. The goal is to inspire a stronger Russian identity against immigrants from former Soviet republics with an Islamic majority. Although it seems to be quite an odd connection, the Vatican-Russia alliance is due to continue in the Middle East. It will last at least as long as the West refuses to view the major changes happening in some of the most tormented areas of the world with both strategic clarity and urgency.